Do you KNOW THINGS that will help your target audience? Your target audience is looking for answers to their questions and problems. Can you help them? If you have things to teach them, a great way is through a blog. Be generous with your know-how, and you’ll grow an appreciative and loyal audience. Does your target audience SEARCH for information online? Are your prospects & customers going online to ask questions and look for answers? Google isn’t just the name of a business anymore—it’s a verb. “Google it!” has become the way we find information now. Do you want your target market to get their answers from you or your competitors? Do you want your readers to TRUST you and LIKE you? Sharing helpful information on your website through a blog inspires trust and likability with your visitors. If you allow comments on your posts, invite people to share and be engaged with them. People want to do business with those they trust and like. Do you have COMPETITORS? Do you want to STAND OUT? Be the blaze orange in a sea of camouflage. If your competitors don’t have a blog, you can stand out by having a great one. If they do, can yours be better? What can you do different? What makes you you? Do you want GOOGLE to find you? 500 pages of blog posts gives the search engine spiders a lot more content to crawl than 10 core company pages. Give those engines something to find! It won’t happen overnight, but over time your posts will become a library full of value. This is the very best way to get the SEO traffic you’re looking for. Do you want OTHER SITES to link to you? Links coming to your site from other good websites is great for SEO, too. But they have to have something to link to. Valuable content is that something. And, while you’re at it, link to other sites when they’ve got share-worthy content. You’ll be doing both them and your readers a favor. Do you want MATERIAL for your SOCIAL MEDIA platforms? Are you on Facebook? Link to your latest blog post. Twitter? Tweet the best 2-3 lines. LinkedIn? Share your post with your connections. You get the idea. This post will go on my Google+, LinkedIn and SlideShare profiles. SO…will a blog help you attract and keep customers? The biggest challenge of an effective blog is creating your editorial calendar and then sticking with it. Posting sporadically won’t give you results. Posting regularly—along with a few other strategies—will. 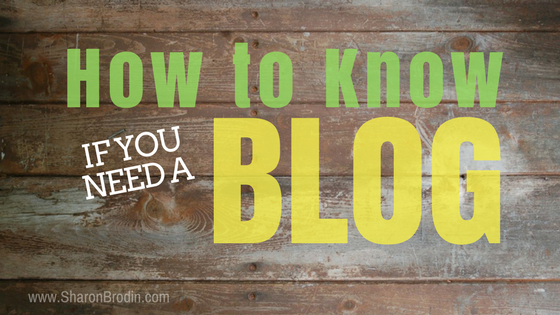 Do you know you need a blog, but haven’t been able to get it going or keep up with it? Shoot me an email or give me a call. I can help!